Megan Abbott says that when she was reading the great hard-boiled writers of the ‘30s and ‘40s she became “intoxicated with the way the books appear very simple, but are not simple at all.” (New Statesman) Her first few novels – Queenpin in particular – have notable affinities with this earlier tradition. In her more recent novels, from The End of Everything (2011) on, she has turned to more contemporary subject matter. 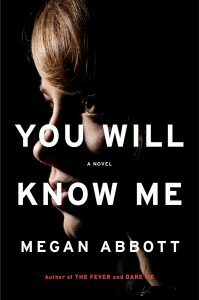 But she has at the same time moved ever closer to that intoxicating sense of apparent simplicity combined with depth of meaning and the treatment of serious themes – most of all in her stunning 2016 novel, You Will Know Me. In these last four books, Abbott’s narratives recurrently probe the psychic wounds of the post-1980 American suburbs – the hidden desires and fierce ambitions, the bouts of hysteria and the heedless self-absorption, the competition-cursed relationships. Each novel gives readers a gripping combination of mystery and suspense, but with so many layers of culpability and denial that every step towards resolution leads us to see the whole idea of ‘resolving things’ as delusory. You Will Know Me centers on a young gymnast, Devon, who is precociously aware that any slip could change her entire life. If this is true of a slight slip at the end of a spectacular vault, how much more true of slips in the endlessly tricky business of relating to other people, of loving and hating them without destroying the dream of flawless success: “To imagine a darkness at the center of that bright-lit, summer-skinned, effortless girl was very hard.” A different kind of dream – a lean-hipped, impossibly beautiful young man – threatens to unbalance the perfect equilibrium. When he is killed in a hit and run accident, there is more than one suspect, and Abbott’s satisfying narrative twists keep us on the edge of our seats until the novel’s end. She ultimately gives her readers a clear, uncontestable answer to the question, Who was driving the car? But almost every main character is caught in the tangled skein of carefully concealed guilt. Even the most innocent has lied, and there is little prospect of moral and emotional closure. As the novel ends, choices – probably not very good ones – are still being made. Devon is not in the habit of divulging the thoughts and feelings under this toughened exterior (“’You never want to hear what it’s like being me,’ she whispered…”). But then, in Abbott’s suburbia, she is scarcely the only character who keeps things to themselves. Others chatter relentlessly – about looks, clothes, gymnastics, carpooling – but seldom with the aim of communicating either their real thoughts or their knowledge of the truth. And this, it seems, is just as well, because it is deception that binds together both community and family, that gives them strength: “That’s what families were, weren’t they? The strong ones, the ones that last. Not supporters or enablers so much as collaborators, accomplices, co-conspirators.” You Will Know Me is wonderfully disturbing and compelling – a remarkable novel, highly recommended.